The public is invited to attend an opening reception for the “Creative Makers of the Pennsylvania Wilds – A Traveling Art Show,” from 6 to 9 p.m. on Friday, November 3 at the Winkler Gallery of Fine Art, 36 N. Brady St., DuBois. This unique exhibit features profiles and photographs of 22 members of the Wilds Cooperative of Pennsylvania, a juried arts business development program that includes artisans and producers from across the 12.5-county region known as the Pennsylvania Wilds. The artisans and producers are shown working in their own creative spaces through the lens of Katie Weidenboerner’s camera. A Wilds Cooperative member and photojournalist, Weidenboerner spent months traveling across the region – tallying over 2,060 miles – to capture images that tell the story of these creative makers. A Touch of Nature, Alabaster Coffee, Alpaca Creations, Amanda Lewis, Brenda Nicklas, Carol Cillo, Chris DeStefano, CF Lawrenson, Ellen Paquette, Highland Chocolates, Hughes Pottery, Jack Northrop, Kim Gates Flick, Laughing Owl Press, Lynn Kibbe, Paul Stanizsweski, Perry Winkler, Rich Horner, Shandra Wilson, Stephanie Distler Artisan Jewelry, Steve Getz and The Muddy Moose Bath Boutique. The Creative Makers of the Pennsylvania Wilds – A Traveling Art Show is a recent undertaking by the PA Wilds Center for Entrepreneurship, Inc. (PA Wilds Center), a nonprofit continuing work that started at the state level over a decade ago when the Pennsylvania Wilds Initiative was born. This groundbreaking effort brought together 13 counties seeking to brand a quarter of the Commonwealth as the “Pennsylvania Wilds” and market it as a destination. The goal was to boost local economies while simultaneously inspiring stewardship of communities and natural assets. 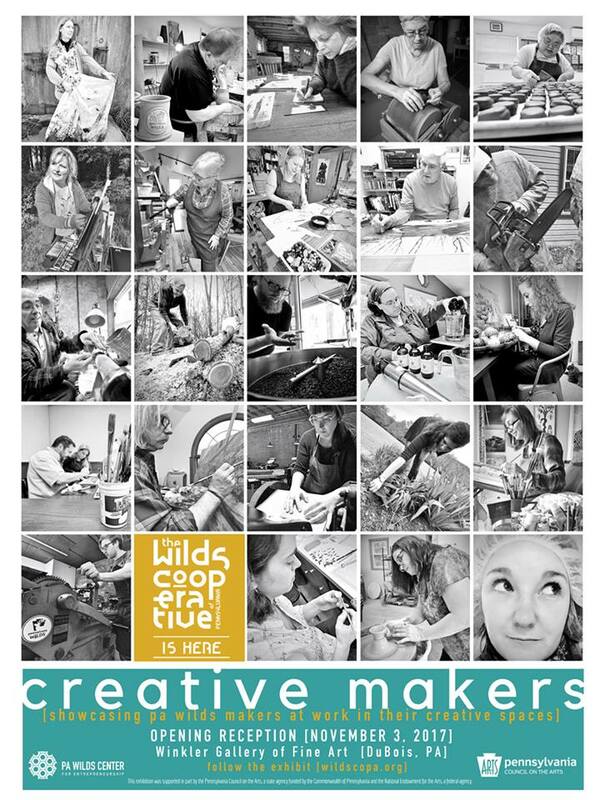 Engaging regional artists and craftspeople was key to building a meaningful regional brand, and the Wilds Cooperative of Pennsylvania is the product of the initiative. Today, nearly 200 local artists and craftspeople participate in the program. The opening reception is free to attend. To register, visit http://wildscopa.org/event-2687392. Born and raised in the PA Wilds, I grew up surrounded by vast forest in a supportive, small town community that's been home to 5 generations of my family. After 10 years of living in urban areas, I relocated back to my home in the Wilds. While I love to adventure and travel, the PA Wilds Lifestyle to me is second to none... it's the great forested landscapes, fresh air and room to move, close-knit communities and endless opportunities for outdoor recreation, fun journeys, the arts and unique and authentic small businesses. Wild and welcoming!